J and I finally met up to have some girl catch up time and we woke up early to go brunch. Well not that early, but we got to Vancouver around 11 and when we got to Jethro’s Fine Grub, we were told we would have to wait 40 minutes. The place was really tiny and 40 minutes is usually an okay wait for me, but I had other plans after. So we decided to go elsewhere. J suggested Adonia, and we called to make sure we could get a seat, and off we went. 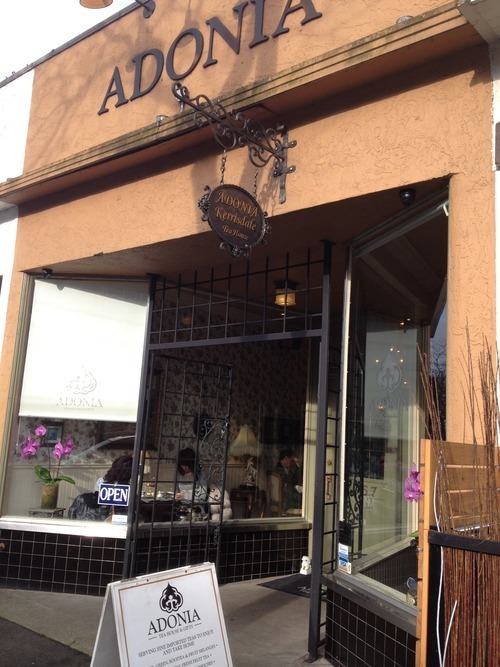 I love how the chinaware is super girly at Adonia. 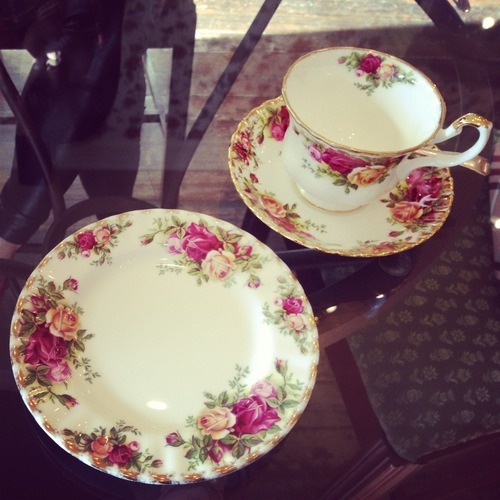 All the floral and golden details make you feel like you’re at an actual tea party! 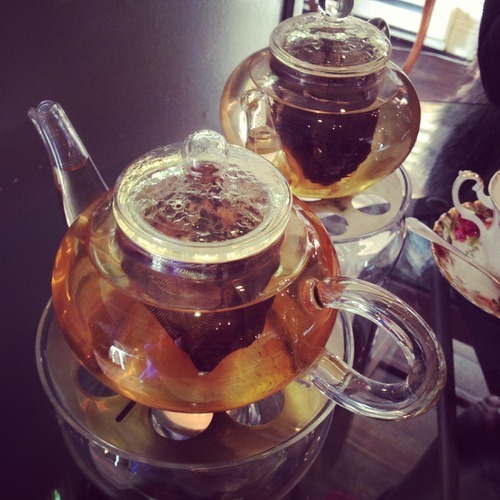 Their teapots however, were not as girly as I had imagined them to be. For myself, I got the Mango Passion Fruit Green Tea. My mini afternoon tea set came with a choice of tea, so I chose this fruity green tea. I usually like floral teas, but this fruity tea was a nice change. A hint of sour and sweet, but not overwhelming. 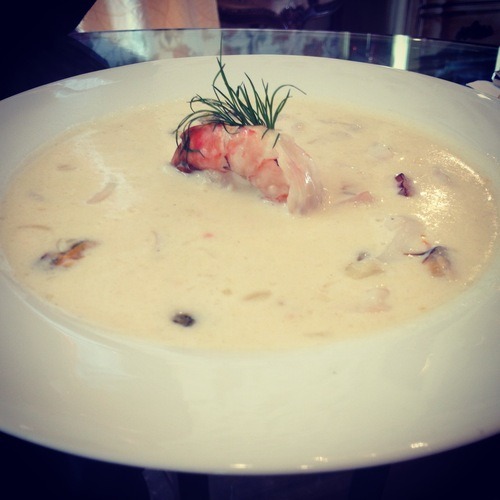 J got the Seafood Chowder, but I never tried it. It looked appealing though, with an actual large piece of shrimp in it. Smoked Salmon – Gourmet sandwich with smoked wild sockeye salmon, dill cream cheese, sweet red onion and capers on foccacia bread. Served with a side salad. For her entree, J got the Smoked Salmon Sandwich. I was so tempted to get this too! 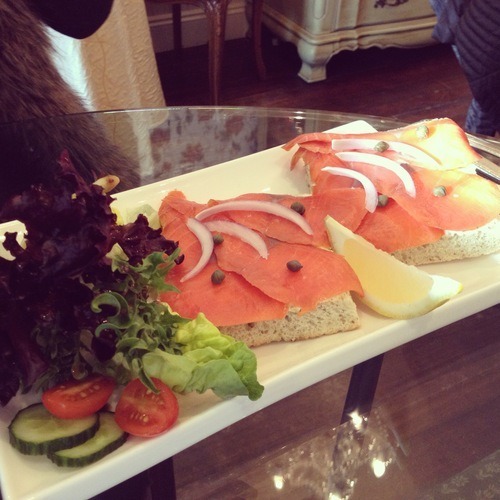 It looked delicious with loads of smoked salmon on the foccacia bread, topped with onions and capers. 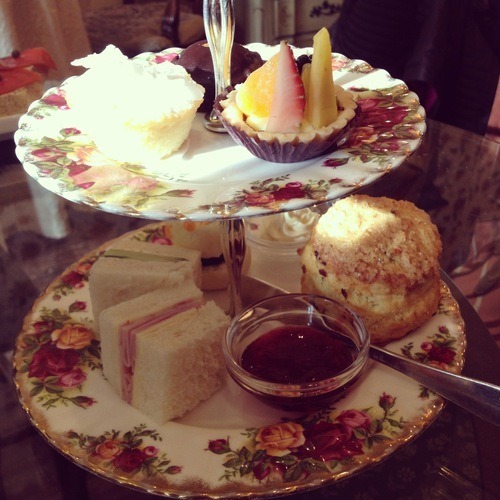 Mini Afternoon Tea – A sampling of our afternoon tea. It includes 7 pieces of mini sweets and savories accompanied by your choice of tea. 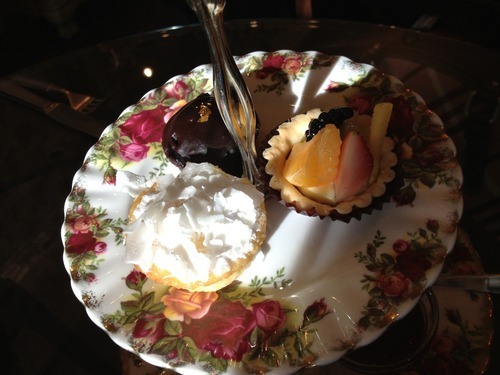 For myself, I got the Mini Afternoon Tea. 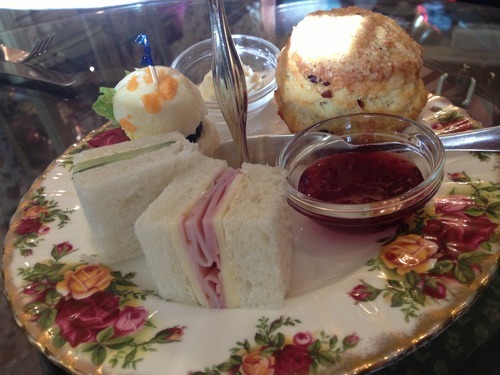 This was for $18 and included your choice of tea, so an average price for high tea. They also offer just an afternoon tea, which is their deluxe version and I’m guessing includes much more. That one, however, is $27. On the bottom tier, we have our savories. The sandwiches were all very basic sandwiches, but they were presented nicely and delicious! Simple ingredients, but executed right! The scone had berries in it and top with sugar on the top. It wasn’t my favourite, as I found it a bit too dry, but scones aren’t my favourite. The top tier was filled with 3 desserts. I’m always excited to try the dessert section! I didn’t find them any special though. They were all decent, but nothing made me go wow! I did enjoy the Fruit Tart though, but I think it was because of how nicely it was presented. Each piece of fruit, although small, was sliced nicely so it would all fit on the tart. Overall, Adonia was average. I don’t think it was anything amazing and the service wasn’t exactly the best either. Also, you don’t know what the savouries and sweets are before hand. So you really just get a surprise, whereas many other high tea houses have a menu listing the different items that you will get.